Since appearing in Woodcarving back in 1995, as a new developing carver, Don Powell's carving career has gone from strength to strength, but has taken an interesting path to get him where he is today. Don is situated near Maleny, on the beautiful Blackall Range just north of Brisbane, Australia and having started carving from a young age, his work has given him - and others - much pleasure and satisfaction over the years, as we find out here. From a young age, Don would be in his father's workshop. His father was a curator at the Marks-Hirschfeld Museum of Medical History in Brisbane. Don tells us that he has always enjoyed hand-held carving and remembers being in his father's workshop as a young boy and picking up a scalpel, and with that, he began carving. Don would constantly practise with the tools and play with pieces of wood lying around. Shortly after he joined the police force, Don read Dona Z. Meilach's book, Contemporary Art with Wood. This broadened his horizons and he bought a basic six-tool European carving set and carved some abstract work. During his police career he was a keen competition pistol shooter, representing his state. His pistol shooting led him to carving orthopedic pistol grips; mainly the Olympic Free pistol and Rapid Fire pistol grips, which have a wrap-around grip. Don carved mainly in walnut (Juglans regia) and maple (Acer campestre). He comments: â€œWhen a keen sportsman commissions you to carve them a fitted orthopedic grip, they have got to be perfect.â€ Don attributes some of his attention to detail back to those grip carving days. As Don gets older, he tells us that he finds the craft of woodcarving particularly relaxing and he will often complete a carving while on holiday, packing up a few tools to take away with him. Don is a man who is content with his lot in life. He has a beautiful home on Mountain View Road, which he built in 1999. He has five children, lots of grandchildren, a reputation as one of Australia's top woodcarvers and teachers, and his wife who is a great cook and the toughest and most constructive critic of his work. 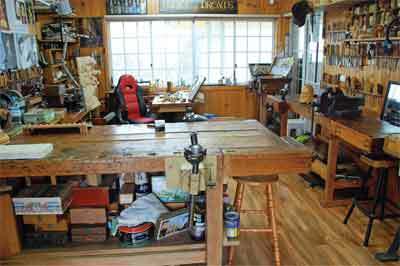 Visitors to Don's studio and workshop are lured and lost into the ambience of his woodworking world. The shelves on his timber-lined walls are crammed with carvings of heads, horses, eagles and plenty of other designs, maquettes and a number of demo pieces from classes held in his workshop over the years. The workshop is certainly set up to take classes, with chisels lining the walls and pictures and bookcases surrounding. The workbenches are set up to accommodate about six students and Don has an old Swedish draughtsman's drawing station and a jeweller's bench crammed with kit and surrounded by tool cases. It certainly can't be said that the space is sparse. He has also built a shed on the property to house his timber supply and power tools. When looking to his workshop tools, Don loves fishtail chisels, but also relies heavily on No.11 gouges. He also uses bent skew chisels, Cogelows and Ashley Iles' tools, who customised chisels for Don and have made him a set of custom long back bents to his specification. 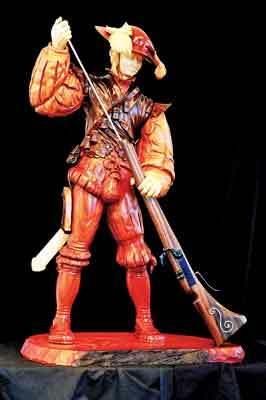 He tells us that he uses miniature back bents in his mammoth ivory carvings and regards himself as a knife specialist. We asked what the woodcarver's favourite woods are to work with, but Don said that to choose a favourite wood is difficult, having carved with so many different species. For sheer pleasure, English lime (Tilia vulgaris) is hard to beat and boxwood (Buxus sempervirens) for fine miniatures. a piece. For some, this method - relying on visualisation - may be a challenge, but Don tells us he was always able to see a face or a horse in a blank, whereas others would simply see a block of wood. 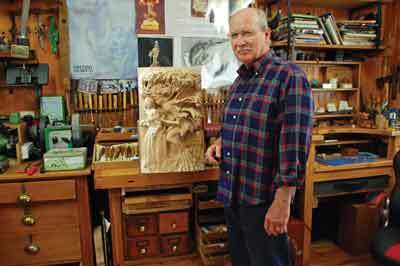 Over the years, his work has changed, eventually encompassing life-sized carvings into miniatures. Don has just completed a life-sized sculpture for a Christian College. The piece was a commission, to be made in the style of Henry Moore. 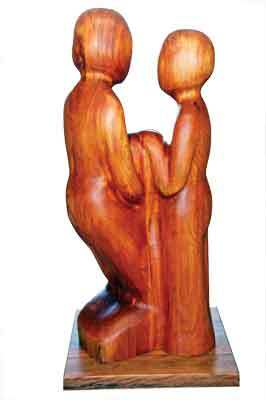 Don created the sculpture to be a teacher and child student, with the world symbolically held between them, using two red cedar (Juniperus virginiana) tree trunks, laminated into one block for this particular project. 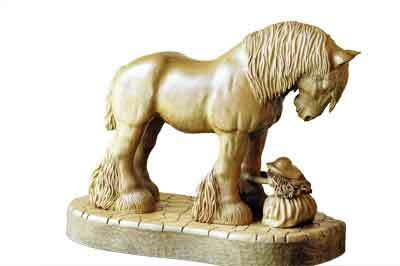 Don's miniature carving first took off with a commission to carve miniature carousel horses, which he did using boxwood and ebony (Diospyros spp.). After this, Don began carving jewellery, mainly pendants. With his daughter, Shari - a jeweller - the pair collaborated on pieces and she would market the work. This was a great opportunity to get his work out there. Don quickly moved onto working with mammoth ivory - staying clear of the modern ivory trade - sourcing the ivory buried in glaciers or the tundra of the northern hemisphere. He tells us: "The mammoth ivory carves beautifully and holds great detail. Mammoths died out thousands of years ago and if only mammoth ivory was used today, there would be no demand for ivory from living creatures." Recently, Don has carved a piece of jewellery in cocobolo (Dalbergia retusa) for a magazine feature. Don has always been a busy carver and fitted a great deal of teaching into his regime, but recently he has scaled back on the teaching, giving himself more time fulfilling commissions and his own choices. A particular scene carved by Don, was one from the Lord of the Rings books and it has always been a favourite of his. 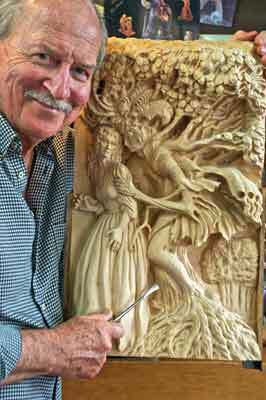 He carved the piece before the movie adaptation had been made and was sure to make it with the Tolkien family's consent. 18 different woods. Currently Don's work-in-progress is a jaw dropping high relief after Arthur Rackham and a chess set based on medieval figures. 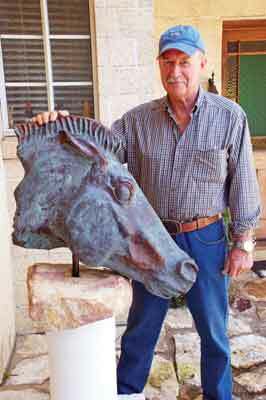 Early last year, Don carved a large horse's head, which was inspired by the Elgin Marbles, for an outdoor sculpture. Years ago, he acquired several large sections of scented rosewood (Dalbergia latifolia), which had been lying in the bush for a long time. This wood can really withstand the weather and Don kept it in his wood stock for about 20 years. He intended to carve it with a sculptor's axe for a story. However, the wood was incredibly hard with twisted grain, so the axes were discarded for a chainsaw and Arbotech, then traditional chisels and a heavy gidgee mallet. The finished carving had to be able to withstand Maleny weather, so Don finished the head with liquid copper and treated it with acid to affect the patina. The finished sculpture stands outside his house and its material fools everyone. Don is no stranger to large works, having been commissioned about four years ago to work on a project for Saint Mary's Cathedral in Sydney, culminating in the Pope's visit to Australia. One piece he worked on was a cathedral chair for the Pope, a complex piece comprised of a multitude of figurines and miniature heads of various saints. The work took three years and Don says he was pleased the church insisted on using Australian artists. He was one of only two Australian woodcarvers chosen for the job, a testament to his reputation. 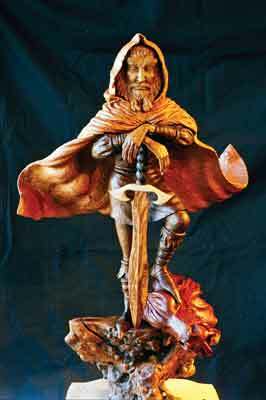 His talent was also recognised when he won a Churchill Fellowship in 1996 to study techniques of woodcarving and wood sculpture in Germany and Switzerland. The carvings were all completed using Queensland maple (Flindersia brayleyana). Don is a romantic, which is reflected in his work characterised by realism and fine detail. He loves carving people with their character, expressions and clothing offering so much scope. But, next to people, he likes to carve horses, encapsulating their sheer beauty with so many facets; majesty, power and action. Don explains that this offers him such a rewarding challenge. Don's last carving was a medieval chess set that he designed and carved in walnut and pear (Pyrus communis). He is now carving a commission of The Lewis Chessmen. The white pieces are carved in ivory wood (Siphonodon austra lis), which was apparently used by pioneers in Australia for utensils, spoons and artificial limbs. It has close grain and finishes finely.